What is the Consulting Compass? Are you making the mistake of using Bro-Marketing tactics in your B2B consulting business? If so, you need to stop… right now! Before I get into why you should stop using these tactics, let us first start with defining just what bro-marketing is. This is important as you may be deploying these tactics in your business without even realising it! In its rawest form, bro-marketing is what we see in our Facebook feeds every day. You know the adverts - where some ‘dude’ is talking about how he turned his business fortunes and life around in an incredibly short period of time, all because he did this one ‘secret’ thing. And as a result, he’s now LOADED! Invariably he’ll be surrounded by supercars and/or be standing in front of a mansion. He’s the person YOU want to be! 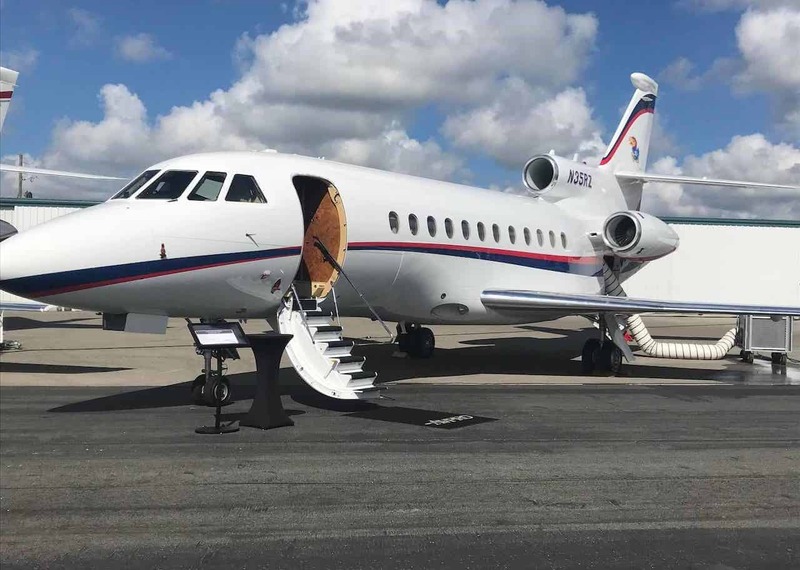 You’ll likely have seen bro-marketing being deployed by many well-known and respected names such as: Grant Cardone, Tai Lopez, and even some of the older well-recognised and established names in consulting, such as Alan Weiss. (For some more great descriptions of all things ‘Bro’, check out business coach and anti-bro-marketer Carolyn Herfurth’s Bro Dictionary). Don’t be mistaken in thinking that bro-marketing is only practiced by extroverts. Oh no. Bro-marketing also exists in a more subtle, somehow more believable form. And that is using text over imagery. Only 5% Of People Will Ever Learn This Secret Formula - Find Out Now! Bro-Marketing can be summed up simply as: Aspiration marketing using inflated imagery or statements to present a desirable future or unmissable value. And I've no doubt that it works. You see, the truth is, for the majority of solopreneurs and micro-businesses, achieving success is a struggle. And that's no shame because starting, running, and growing a successful business is a lot harder than many people will have you believe. But the quest for success can become all-consuming. Maybe even desperate at times. The solopreneur and small business owner finds that they'll buy anything that promises success. A silver bullet to success in business - seemingly no matter what industry you’re in! However, if we're honest with ourselves, we know that if success in business was easy - if it was guaranteed - then everyone would be running their own business! The real question is, do these bro-marketing tactics that worked so well in the pre-Trump, pre-Fake News, pre-Cambridge Analytica days, still work today? And should you be using them in your B2B consulting business? Before we determine that, let's look at some more examples of bro-marketing-type tactics. Thanks to Russel Brunson of ClickFunnels fame, many people have been taught the concept of the ‘stack slide’ through his book ‘Expert Secrets’. It is a good book, but I'm not certain that it is still relevant today as many aspects fall under what I would consider bro-marketing, and so are becoming passé. You’ll recognise the 'Stack Slide' when you see it. It’s the webinar you watch where near the end there’s a core offer - say a $1,997 online course (incidentally, $2,000 is the recognised ceiling for being able to sell an online course without having to actually speak to someone as part of the sales process). The simple concept is to ‘stack’ apparent value that makes the cost seem very small in comparison to the financial value of the entire stack. It inflates the the value of the course from its cost of $1,997 to a value of, say, $12,000. You’d be a fool not to take up the offer! So whilst the ‘stack slide’ principle is perhaps not recognised as being bro-marketing - because it doesn’t involve flashy cars and mansions - it’s a variation on tactic 2. Combining good copywriting with delivery typically through a webinar. Here's the problem I have with the concept of the stack slide. This type of offer can be disingenuous. For example, how many of the ‘lead magnet’ PDFs that you've downloaded have you never even opened? How many online courses have you bought and never completed? Did you know that completion rates for online courses are known to be less than 5%? And the lower the cost of the course, the lower the chance of you ever actually completing it! So, if very few people even complete the courses that they pay for, and the cheaper the course the lower the likelihood of completion, then what value do all these ‘free’ stacked bonuses really have? I’d say in many cases a big fat ZERO. They're not really bonuses - they're just perceived bonuses. In stacking a bunch of benefits - the value of which is mostly conjured up - you’re not actually helping your client. It’s just information overload. And your clients don’t need more information - they need transformation. The next bro-marketing tactic I see is the discount. Undoubtedly you’ve also seen this. The course that’s normally $4,997 but today - right now - it’s $1,997. Here’s an example from Tai Lopez. 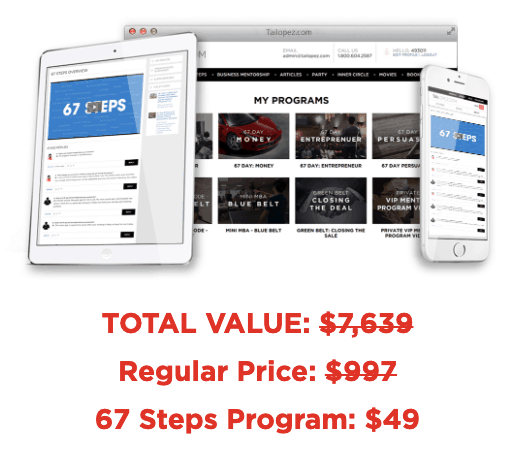 His course - the 67 Steps - is being sold at below 1% of its stated value! Just think this through and consider the damaging impact this can have on your brand. Whilst It makes sense for clothing shops to have sales, and to discount as they need to clear out seasonal stock, by frequently offering discounts it damages their revenues in non-sales times. That’s because, especially in the UK at least, shops discount so frequently that most people don’t even bother shopping when there isn’t a sale on! The other thing to ask yourself is this: If a product was originally sold for twice its current value, is it a good product? Or was it over-priced before? Was it ever even sold at that higher price in the first place? Is it even selling? (In the UK you can’t claim a price reduction if you didn’t sell something at it’s full price in the first place - more details here). What I’m not saying is that these tactics don’t work. I'm also not saying that people are wrong, immoral, or dishonest for deploying these tactics. 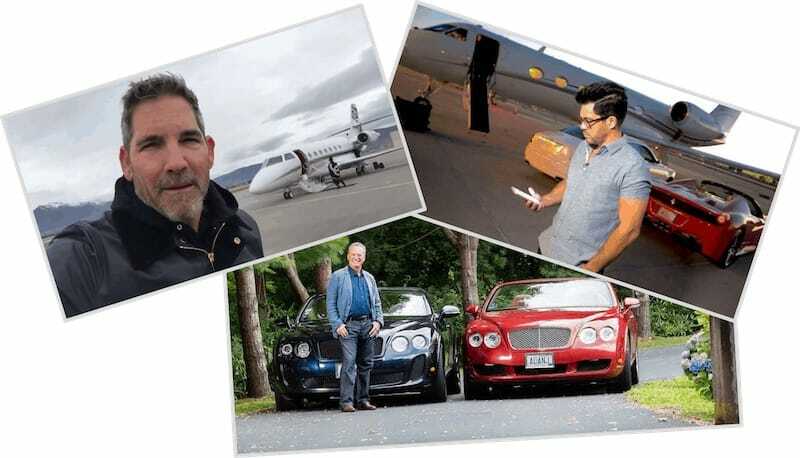 When it comes to the people I highlighted earlier, I like a lot of what Grant Cardone says, and I've always been a fan of Alan Weiss. The question is, do these tactics have a place in your B2B consulting business? Should you use bro-marketing tactics in your B2B consulting business? And the reason I say that is because they lead you to approach the selling of your consulting products and services in entirely the wrong way. Instead of focusing on the value to your client - the value of the transformational outcome that you are providing them - by offering stacked benefits, using false scarcity, and made up discounts, you are in fact devaluing your services. What you should be doing is, rather than rushing the sales process and pushing the client to buy - which risks far greater buyer’s remorse - you should be slowing down your sales process. You should be taking time to deeply understand your client’s situation. To understand the value of the transformational outcome that you can provide, and thereby determining an appropriate fee. What's good for me might not be for you! The real problem is that a lot of business coaches who offer help to solopreneurs and micro-businesses deploy these same bro-marketing tactics. I’ll give you a case in point. I watched the webinar of a business coach last week, and within the space of a day I’d received two emails offering a 50% discount! What impression does that leave me to the quality and value of the course? What impression do I have of their approach to sales? It makes the course sound low value. A commodity. That perhaps if I were to hold out for another few days the price might come down even more! One of the reasons why business coaches sell this way is because selling coaching to a solopreneur or micro-consulting business owner, although it is a B2B transaction, the mindset of the buyer is more that of a consumer. That’s because they are 'spending' their own money. But when you’re selling consultancy to mid-sized and large corporates, they aren’t ‘spending’ money. They’re making an ‘investment’. An investment to achieve an outcome. What they’re not doing is investing in your services because you’ve offered a discount, or because you’ve stacked your offer with (mostly fictitious) value. The value that you must be selling is the outcome to the client - not how cheap or scarce your service is. Can you now know see the importance of having the right mindset and understanding of where and how to place value? I would argue that if a business coach is offering their services to you at a discount, then they’re not the right coach to help you build a successful B2B consulting business. How can they be if they don’t know how to demonstrate the outcome value of an investment? So steer away from any of the bro-marketing tactics detailed above. Instead focus on value. on understanding your client. On determining how you can help them, and what value that has to them. If you want to know more about the best way to proposition your consulting services to your clients - the high revenue, high profit way, then take a look at our free training masterclass. I should declare here - in light of the article above - that the only thing we provide for free is information! This blog; the training masterclass; and our resources. Transformation, on the other hand - you know, the bit where you get a return on investment - that’s what people pay for. We don’t do false scarcity. None of these things I’ve ever done as a B2B consultant, and neither will I do them as a B2B business coach.